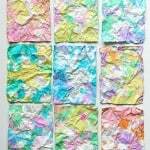 Are you following our Art for Kids Pinterest board? 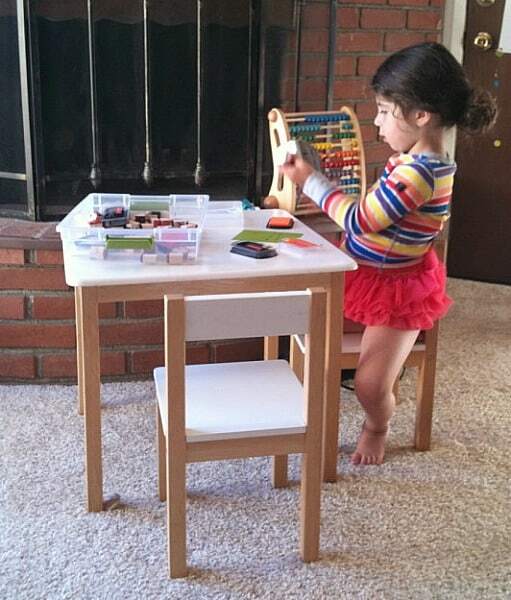 Lucy is one of those kids that loves to learn, really loves it. She is extremely inquisitive about everything (that little mind never stops), has a great imagination, is reading fluently (and must know what each and every word means if she’s never heard it before) and loves talking about stories. The list goes on and on- that girl loves to learn! The only area where she lacked some confidence was writing and drawing. 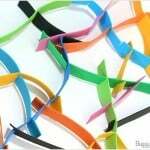 Fine motor skills can be challenging- it’s hard for those little hands and fingers to get on paper what your brain sees. Not only was it challenging and a bit frustrating, but I felt like she over thought what her writing and drawing looked like and compared it to the other kids around her. It just seemed so young for someone to already be so critical of themselves and so aware of herself in comparison to others, but she was. 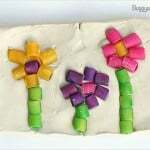 So summer came, and I remembered reading about a project on one of my favorite blogs, Tinkerlab. It was called Tinkersketch, and basically it was a challenge to use your sketchbook everyday. 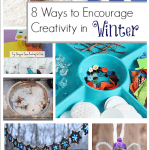 I remember the author had mentioned how her own kids were more creative when they witnessed her creativity. I thought hard about doing it, but was really nervous. I don’t think I’ve ever even owned a sketchbook in my life. I am NOT an artist and do not feel creative in any way. I’m a very math/science type person and definitely have a type A personality. Creative is the last word I would use to describe myself. 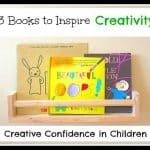 So how could I model creativity for my kids? The more I thought about it, it was just what Lucy and I both needed. She had the same hesitations I had in a way, and what better way to help her, than model my going through it myself. I grabbed a notebook I had (a little Moleskine journal because I am addicted to pens and notebooks -I would never dare to call them journals or sketchbooks). And I just sat by Lucy while she was doing her own stuff and drew. I don’t even remember what it was that I drew. She just watched and wanted to do it too. Lucy ended up grabbing an old notebook and drew random lines and threw some stickers in. We talked while we were doing it- she wondered what I was drawing and said a few words about hers. It was nice. Then I uploaded it on Instagram to share with the other Tinkersketchers (#tinkersketch). I remember being soooooooo nervous about it- putting it out there in public- how embarrassing!! But, I amazingly survived and Lucy loved seeing it uploaded in an album on our phone. So we did it again the next day. It became a fun routine that we both looked forward to everyday. We made a trip to the store eventually and picked out our own sketchbooks (crazy!) and began using those. Fast forward to today and the transformation in both of us is amazing. I love my time working in my sketchbook. I even do it alone sometimes- it’s peaceful and relaxing. I am quite aware that I have no idea what I’m doing really, but I don’t care. It’s fun and I think that’s the point. And when I do it with Lucy, it’s a special time for us. (Although Theo does like joining in sometimes too.) We can talk about anything (sketchbook related or not) and just have fun. 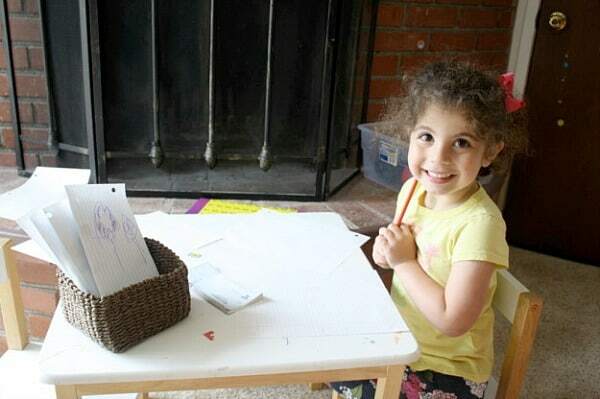 Lucy LOVES drawing now and even writing words. She makes posters and signs all over our house, she creates books full of illustrations and writing and, most importantly, is confident and proud. Now that summer break has ended and Lucy is back in preschool, we don’t do our sketchbooks daily, but we still do them frequently, especially when inspiration hits us. The other night we were reading a Charlie & Lola book and Lucy said, “Look how the pictures look real and not real. How did they do that?” So we studied them and decided we’d try it ourselves the next day in our journals. 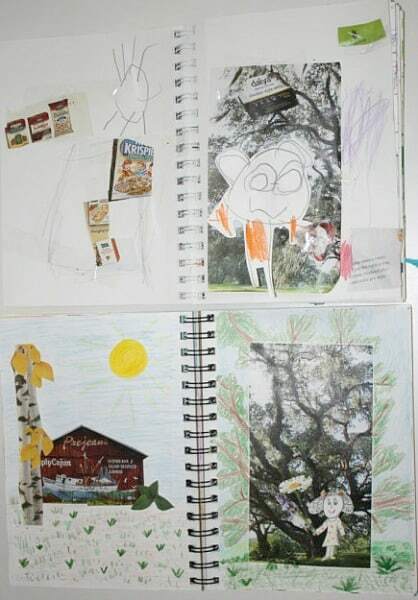 The next morning we cut out some pictures from old magazines and glued them in our journals. Then we added our own drawings. Lucy was so excited to be able to recreate what she had seen in her storybook! I hope we’ll continue this for years and Theo will join in more often. I can’t wait to take him to get his first sketchbook too! That looks wonderful! How old is your daughter? My oldest is 3 and I was thinking about doing this with her. I’ll have to give it a try! wow, I love this! I am going to enter this workshop: http://www.dutchessoforange.nl/creative-fitness-the-english-version/ and will now let my girl join in. Your story about Lucy is just almost like it is written about my girl! Thank you! This is such a cute idea! 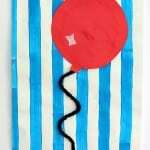 I have a 9 yr old who is a little artist but a 5 month old as well and think this will be a perfect project for the two of us soon! Maybe even the three of us. Thanks for sharing! I just love this! 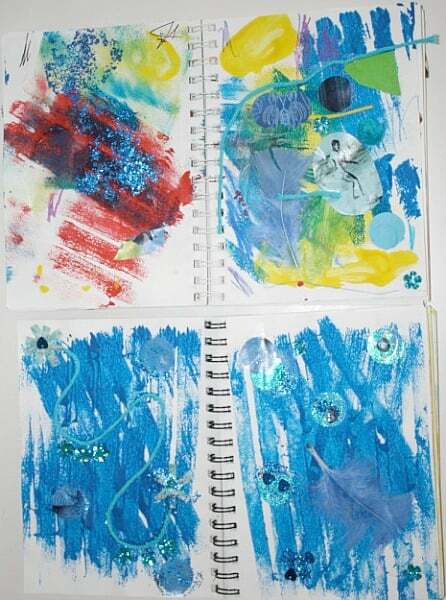 I started journaling with my son, but never through to try creating a art journal side by side. He’s very similar to your daughter…anything that I do, he likes to try and emulate as well. Thanks so much for sharing this!! I love how you journal with your son. I’ve been wanting to get started doing that with Lucy! 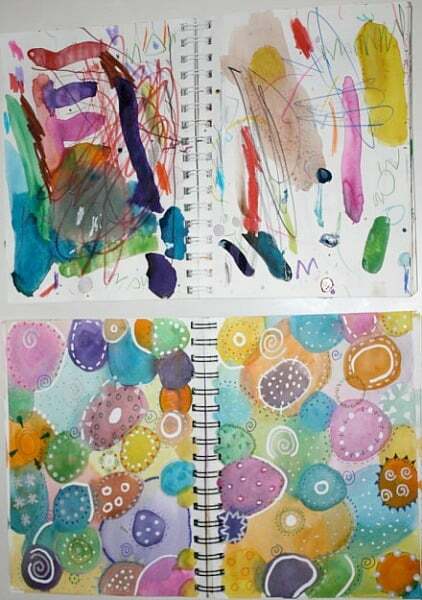 Chelsey, This is a wonderful way to help your inquisitive daughter to explore creative ways to express herself! I am not an artist in any way either; but I do love pens, pencils and notebooks, too! I find that they allow me the freedom to doodle, leave myself notes and to explore my thoughts in a space that is all mine! Great idea and I will share! Thank you so much, Katherine. It has been such a great experience for us both, not to mention a special bonding time too! Oh, thank you so much, Monica! It has been one of the best things I have done with my daughter. What a cool idea! I’m a sketcher and my boy loves pinching my materials and scribbling in my artbooks (I actually pinch paper from his artbook too) but I really like the idea of tandem-run books. I’ll let you know how we get on! This post really blew me away! 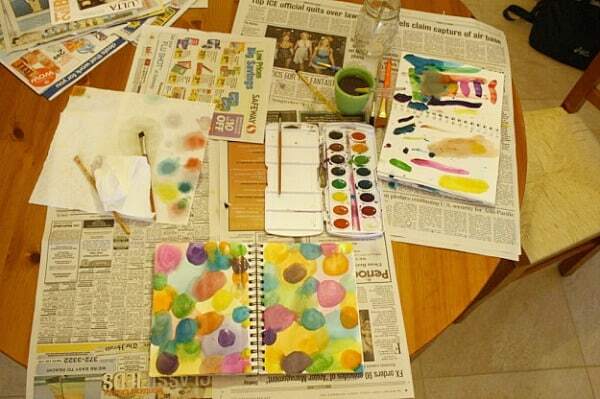 I never would’ve thought of this, as I’m not artistically inclined myself but now, it seems so doable and FUN! My daughter just turned 3, and I really want to start doing this with her this year. Thank you for the inspiration! Love this post! I remember our first steps in tinkersketchland. I remember I was nervous too when I uploaded my first #tinkersketch. Now, as you explain, is part of our life. Sometimes we make it together, sometimes me (or my kids) alone… but, its not an exam and it is kinda therapeutic. So, we love it. I bought my 3 girls sketchbooks but don’t have one myself. Love the process! 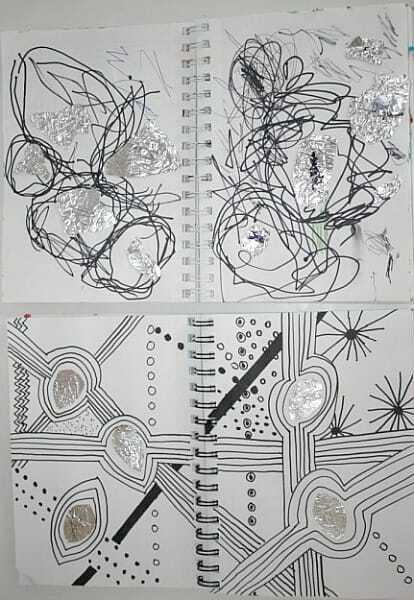 I do this side by side in the same journal with my daughter. I was inspired by Waldorf to help her draw. Amazingly, it was a lot easier than I ever imagined given her learning and attention challenges. I think the movement as I draw attracts her attention. Keep on journaling! This is wonderful. Yesterday my son wanted me to paint with him, and I did a few squiggles on his paper, but this would work wonderfully for us. 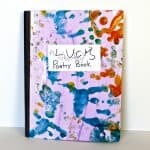 I’ve been wanting to start an Art Journal of my own! I love this idea. My second grader is wonderfully artistic and has numerous sketch books all over the house. I would like to see if my 8th grader would humor me and try it. She’s straight As with a B in her art class this might be a good way to spend some time. I think I’ll try it this weekend. Hi, how did you do the white circles/lines in the top watercolor photo? what did you use? Great idea btw and I love that top watercoloring. Thank you! To make the white lines on top of the watercolor I used one of those white out pens (the kind with liquid inside that you shake and gently squeeze out).